We returned from a short vacation Friday night and Saturday was filled with all the errands except for grocery shopping. As a dinner time approached I turned to the cupboard to see what kind of thing I could cobble together. Lentils and chickpeas provide a bit of protein in a vegetarian dish. We served it with some grated Parmesan cheese, cracked black pepper and a splash of extra virgin olive oil. Desperation can be a source of inspiration in cooking. When an unexpected guest was also a vegetarian I threw together something I had on hand and suddenly we had a tasty alternative to Turkey Tacos I typically make. Not planning on having tacos tonight? This works equally as well as a side dish. Heat 1 tablespoon of oil in a 12″ non-stick skillet over medium for about 1 minute. Add the onions and bell pepper, sprinkle with salt and toss to coat in the oil. Cook for 5 minutes, stirrings once or twice. Add the jalapeno and garlic, stirring them into the carrot and bell pepper. Cook until fragrant, which should only take 30 second to a minute. Transfer the onions, peppers and garlic to a bowl and set aside. Return the skillet to the stove, add the remaining oil and increase the heat to high. When the oil is just beginning to smoke add the summer squash and a generous sprinkle of salt. Spread the squash along the bottom of the skillet and cook, undisturbed for 2 minutes. Toss the pan to redistribute the squash and cook another minute. Return the onion mixture to the pan and add the remaining ingredients. Stir to combine, reduce heat to medium low and cook for 10 minutes. Taste and adjust seasoning with salt and pepper as desired. Your 3 summer squashes should be 6-8″ long and no more than 2-2.5″ in diameter. I prep them removing the ends and cutting them lengthwise into quarters. I then remove the layer of seeds, cut the remaining squash flesh into 1/4″ wide strips and, finally, cutting them into 1/4″ cubes. I often wants a bit of a sauce or “dip” to go with grilled chicken. This week I saw a recipe that marinated chicken pieces in a yogurt mixture before grilling them. I decided to use the yogurt as the base for a dip instead. This one came out a fantastic shade of pink. Process the peppers for 30 seconds in a food processor. Transfer to a sieve and allow to drain for 8-10 minutes. Return the drain peppers to the food processor and add the remaining ingredients. Process for another 30 seconds until well combined. Taste for flavor and adjust salt if needed. I used jarred roasted peppers in the original recipe however DIY roasted red peppers are pretty easy if you have the peppers on hand. The idea for this recipe came from one of the recipe mailing lists to which I subscribe. I liked the concept of pesto with farro. I changed up the add-ins and served this warm. Bring water to a boil in a 4-quart sauce pan. Add the salt and bay leaves; stir until salt is dissolved. Add the farro and stir. Reduce heat to a simmer and cook for 25-30 minutes. While the farro cooks prep the zucchini. Remove the stem end and then cut into quarters lengthwise. Remove the seeds from the center of each quarter and then slice into 1/2″ wedges. Combine with peppers and set aside. When farro is ready drain it and transfer to a large bowl. Mix the zucchini and pepper mixture into the farro. Gently fold the pesto and half of the pine nuts into the mix. Just before serving garnish with the remaining pine nuts and fresh basil. Pearled farro will cook faster than the semi-pearled variety, which is what I normally use. My regular brand (Bob’s Red Mill) was out of stock at the local megamart where I normally pick it up. Luckily I found another brand close at hand. My mom’s favorite vegetable is asparagus. Between mother’s day and her May birthday we have plenty of chances to share it with her. I was a bit tired of the usual roasted asparagus we make though so I went for something quicker. You can either snap the asparagus stalks one at a time or just cut off the bottom 2″ like I do. Rinse the stalks and set aside. Heat a skillet over medium heat and add the butter. Heat until the butter is melted and add the asparagus. Sprinkle generously with kosher salt and black pepper. Toss the asparagus to coat it in butter and then cover the dish. Cook for 3 minutes. Remove the cover, toss the asparagus and cook for another 2-3 minutes until tender. Transfer asparagus to a platter. Turn off the heat under the skillet. Add the lemon juice to the skillet and scrap up any browned bits on the button of the skillet. Swirl the browned bits in the lemon juice and pour it over the plated asparagus. Garnish with the lemon zest and serve. 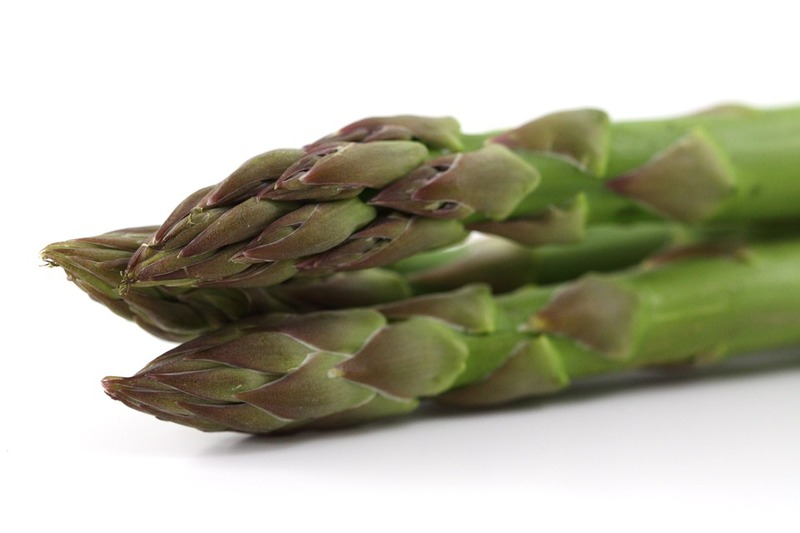 Skinny asparagus will cook faster than the thicker ones. Choose a bunch with all similar thicknesses throughout if possible.